This month’s post covers everything from changing our perspective, burnout, getting outside, and taking better iPhone pictures. Yes, they are all over the place. However, I think being able to live in the moment, get outside, and having free time are things any cyclist would be happy to achieve because it means more riding for us. 6 Solutions For the Chronically Busy – Be More With Less – We choose to be busy rather than to slow down. The tips offer ways to help reduce the busy-ness. My personal favorites are “take back the morning” and “find simple meals that can be repeated”. Beating Burnout – Chris Ducker – Burnout and how to fix it. Our burnout may not be as extreme and we can’t take a 5 day retreat, but we can learn from Chris and add more rest and relaxation into our days. Moments Like These – Slow You Home – It’s the little moments that we forget to enjoy and those are the moments that we should embrace more. Project Go Outside – In Pursuit of Happiness – A nice reminder to get outside, even if it’s 5 minutes a day. It doesn’t have to be epic, it just has to be outside. How I Capture Images with My iPhone – Rowdy Kittens – Tammy has a nice list of tips and apps that she uses to take some gorgeous photos with nothing but an iPhone for equipment. 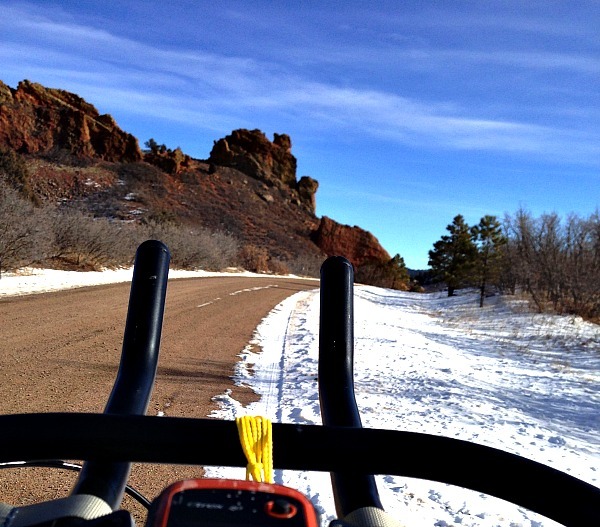 Exploring dirt roads in January can lead to some lovely contrasts of colors – white snow, blue skies, and red rocks. It’s already the end of January and hopefully your 2014 is off to a good start and you are spending your time and energy in places of your choosing. A lot of people start out a new year with lots of goals and plans. For me, that has never worked, and I’m taking a different approach this year. I’m only focusing on the one giant goal of riding the Tour Divide, and I’m not setting any other goals. Instead, the focus will be on setting up habits/systems/processes to make sure each day works towards the Tour Divide. Hopefully, this will create a “new normal” where each day makes a small amount of progress rather than focusing solely on the final result. We’ll see how it goes soon enough.